What creates a woman of beauty and substance? Hardship. Loss. Disappointment. Mistakes. Forgiveness. Acceptance. Love. The tough stuff we label as bad and try to avoid and the good stuff we wish we could learn and apply more quickly. Through struggle, we learn lessons about our true strength. By facing hardship, we recognize that life is difficult and that we are up to the challenge of living it well. In forgiveness, we find relief and peace. When we forgive others, we discover our capability to survive hurtful words and deeds. In this strength, we move forward. 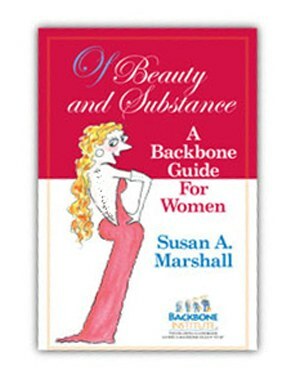 Of Beauty and Substance: A Backbone Guide for Women by Susan A. Marshall, is about you and your remarkable future. Susan A. Marshall is the author of internationally popular “How to Grow a Backbone: 10 Strategies for Gaining Power and Influence at Work” and “Life! Be In It.” She is a speaker, columnist, executive coach, workshop facilitator, and founder of the Backbone Institute, whose mission is to create a stronger, more confident future, one person or team at a time.